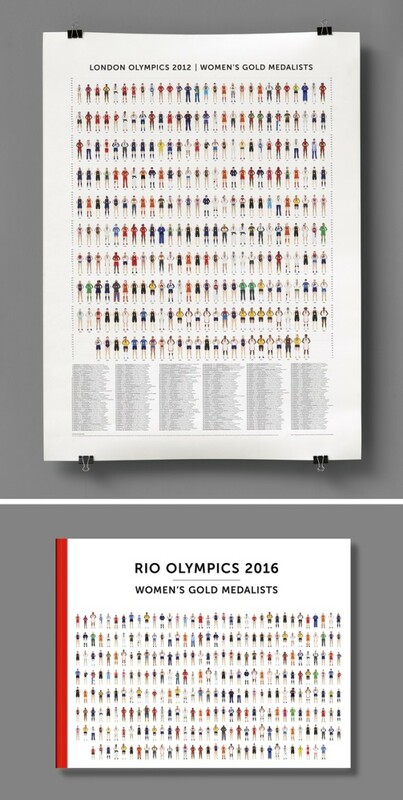 Designer Wendy Fox is back again with her personal project, Women’s Gold Medallist – a visual documentation of all the women athletes who will win gold at the upcoming Games at Rio 2016. This is the second time Fox is embarking on this project; her first instalment for the London Games took home the gold at last year’s Create Design Awards in the Illustration category. 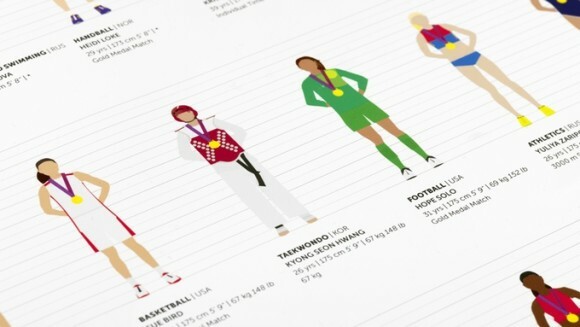 It featured a poster that documented all 276 women who won gold. A collection and representation of data, the project celebrates the diversity of female athletes in the Olympics. For the upcoming Rio Games, Fox aims to not just do a poster but also a book and has started a Kickstarter campaign for funding and support. desktop had a quick chat with Fox to learn more about the inspiration behind the project, her arduous process in producing the final product and what she will be offering for the Rio Games. The London Games instalment of Women’s Gold Medallist took two years to complete. What made you take on such a huge personal project? I was watching the London Olympics. The Olympics is one of the few occasions you get to see women athletes taking part in all sorts of sports. It hadn’t struck me earlier but I realised that there’s a bias when the Olympics is covered in the media. You see more of the gymnasts, the more glamorous sports get promoted much more then say, archery or Judo. And you know, the less the women are wearing the more you will see them, such as the beach volleyball as opposed to the regular, court volleyball. Women, despite their athleticism are still objectified, sexualised and defined by how desirable they are, not by their athletic prowess – which defeats the entire purpose and messaging! And then I started noticing how the bodies of the female athletes vary. They’re all so different. And that’s never the language used for female athletes where they have to be model-like. And I remember seeing articles like ‘Who are the hottest women in London?’ In the lead up to the 2012 Games and I thought that this was quite a gross and strange message to be sending out to the world, to young girls. How are we encouraging them to take part in sports with such messaging? All these female athletes are so amazing in their own right, and so different. And that’s never really appreciated especially when it comes to sort of encouraging girls to partake in sports. And I strongly believe that young girls should take up sports, should do a team sport but there is all this other stuff that gets in the way of them doing it. 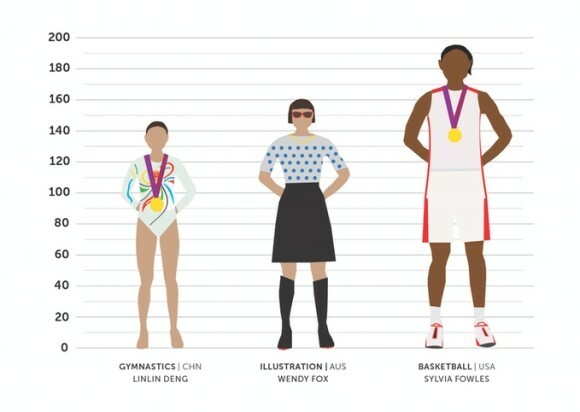 How did you come up with your representation of the female Gold Medallists for the London Games? I actually started off thinking I could do an infographic based on the information I had. I got the information of each individual athlete from the London Olympics website. The data was interesting – they all varied in terms of height, body type and so on. And I wondered what it would look like if I categorised the women by sport and so on. But I started playing around with various mediums and even tried painting to add more visual elements to the data I had. I took all the bases of what I had and did on Excel sheets and went back to the computer and I played around with how I was going to represent each athlete on Illustrator. I tried various ways and decided on a mug shot type visual. Each Olympian is featured dressed in their national uniform, wearing their medal, and standing in a line, in order of height. I kept the illustrations simple, elegant and graphic. I didn’t want to do faces for various reasons but I tried the very best I could to match the illustration with each of their body type, colour of their skin, which I went off photos, and so on so that they’re identifiable. And if they wore glasses, I added that on. Or if they had knee bands and so on. 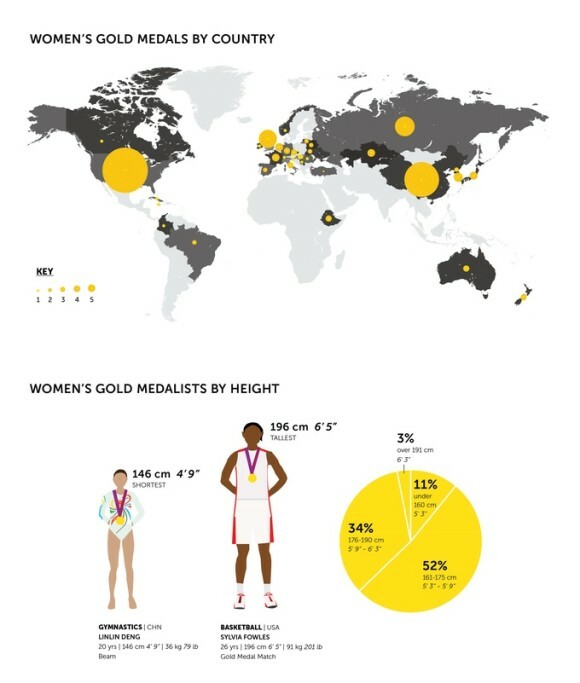 And if an athlete won a few Gold medals, she is illustrated with all the medals she won. What will you be doing different for the Rio Games? The intent for the 2016 Rio Olympics Women’s Gold Medalists is the same – to provide positive media exposure for the female athletes competing in the Games. For Rio 2016, I launched a Kickstarter campaign just prior to the commencement of the games to raise funds and spread awareness of the project. In keeping with the London project, I will be creating a poster, an interactive website and this time, I will also design a beautifully illustrated book that is both a collectible, a design piece and a document of elite female athletes in 2016. Support the Women’s Gold Medallist project on Kickstarter here.